Under the growing threat of lawsuits related to ADA compliance, financial institutions are turning to LKCS to help with their web accessibility needs. LKCS provides affordable web accessibility solutions by auditing websites for adherence to the Web Content Accessibility Guidelines, making changes and updates to achieve accessibility, and ongoing monitoring and reporting of potential future accessibility concerns. To avoid the high cost of a legal settlement, banks and credit unions must demonstrate that they are taking steps to make their web sites accessible to people with a wide range of disabilities and have procedures in place to maintain that accessibility as their web sites change and evolve over time. Nearly 20 percent of Americans live with a disability and the ADA prohibits discrimination against individuals with disabilities and guarantees equal opportunities for them in employment, transportation, public accommodations, state and local government services, and telecommunications. Although the ADA itself doesn’t directly address websites, industry experts and several court decisions take the position that the ADA is applicable to websites and similar technologies such as mobile apps. In December 2017, the Department of Justice formally withdrew setting standards for website accessibility from its agenda. While this matter has been officially set as inactive, attorneys nationwide are targeting financial institutions with demand letters and threats of litigation pertaining to the accessibility of their websites. LKCS has been aware of this potential issue for well over two years. The company has hosted webinars on the topic and its staff has presented related sessions at industry conferences. The LKCS web development team amassed the knowledge, tools, and experience to assist clients with bringing their web sites into alignment with the practical standards of web accessibility that exist, such as the Web Content Accessibility Guidelines 2.0 (WCAG) developed by the World Wide Web Consortium (W3C). “The WCAG web accessibility guidelines were developed with the best of intentions. It’s unfortunate that unscrupulous law firms are seeking to benefit financially through threat tactics. To avoid the high cost of a legal settlement, banks and credit unions must demonstrate that they are taking steps to make their web sites accessible to people with a wide range of disabilities and have procedures in place to maintain that accessibility as their web sites change and evolve over time,” explains Sid Haas, LKCS Vice President of Business Development. LKCS is helping financial institutions, across the nation bring their websites in line with the WCAG 2.0 guidelines at the AA Level. So far, over 50 institutions have found a great value in partnering with LKCS to make their websites accessible for people with disabilities. “In light of recent Credit Union lawsuits statewide, UCCU has been tasked with ensuring that our website is ADA compliant and that we are meeting the needs of all of our current and potential members. Being a small institution without a dedicated Compliance Officer, it is imperative that we have a trusted business to turn to in order to accomplish this task. 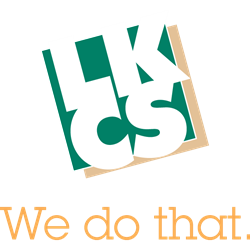 LKCS is always easy to work with and their expertise is essential to helping our small business marketing succeed. As always, they responded very quickly to our request and completed getting our website in compliance,” explains Mark Dietrich, CEO, United Community Credit Union, Quincy, IL. LKCS’ web accessibility services include auditing websites for adherence to the WCAG guidelines, making changes and updates to achieve accessibility, ongoing monitoring and reporting of potential future accessibility concerns, as well as complete website design and development services. For clients with their own web development resources, LKCS can provide access to an online accessibility dashboard giving them the ability to scan, repair, and monitor their own website. This tool provides clear explanations of each accessibility guideline along with recommendations and code examples of how to correct each item. “LKCS’ web accessibility services were designed to provide clients with effective, affordable solutions that, in fact, make their web sites better for everyone. After all, that is the original intent of the accessibility guidelines,” says Haas. More information about LKCS’ web accessibiilty solutions can be found online at https://www.lk-cs.com/ADA.